Welcome to Spring Valley! This cozy raised ranch home is tucked away on a quiet one acre mountain lot on a private road. 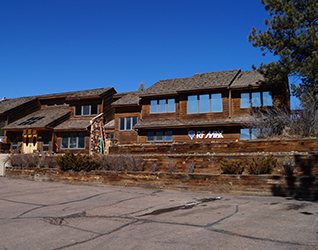 Main level features an open floor plan with vaulted ceilings, skylights, wood burning heatilator fireplace and numerous windows to take in the gorgeous lot and surrounding views including Pikes Peak. Kitchen includes refrigerator, dishwasher, microwave and electric range. From there is a dining area that has a walk out to the backyard with a private deck for grilling or entertaining. In addition the main level has two bedrooms and a large bathroom with a tub/shower combo with plenty of linen and storage area. The walk-out basement has a large family room with plenty of storage and built-in cabinets. In addition there is a third bedroom, full bath with ample storage cabinets, a workshop-mudroom area and laundry area once again with ample storage cabinets. The home has a new roof, new exterior paint, recent septic pump, radon system, fenced backyard and a large supply of seasoned wood. The attached finished garage is 18 X 22 with an additional 10 x 12 storage shed with loft located in the backyard. Pine and aspen trees with a mix of wildflowers grace this lot. This subdivision has a large lake for fishing, canoeing, skating and ice hockey. There are additional recreation areas for hiking, enjoying the Peak views and the abundant wildlife in the area. The clubhouse is a frequent gathering place for community get-togethers. The town of Divide is just five minutes away and Woodland Park is approximately 20 minutes away. The area is home to many amenities including, shopping, schools, hospital, parks, trails and other nearby recreation possibilities. There is a wealth of summer and winter events.